Only A Danger To Me is a beautiful blend of exceptional bloodlines. Her sire, Pusher's Benny Boy, is a World Grand Champion and Plantation HOTY. He is by the influential sire The Pusher CG, also a WGC and sire of champions. The Pusher is one of the main sources of sabino in the Tennessee Walker breed. Only A Danger To Me carries 3 lines to Midnight Sun through her sire, but none of those came through Pride Of Midnight HF. Her sire also brings several Merry Boy lines into the pedigree. Only A Danger To Me's dam, Threat A's Dixie Doll, is a granddaughter of the WGC Ebony Masterpiece. She carries two lines to him, one through Ebony's Treat A (whose dam was a daughter of WGC Triple Threat), and one through Ebony's Black Glory. Through her dam, Only A Danger To Me carries another sever lines to Midnight Sun, but again none of them pass through Pride Of Midnight HF. Threat A's Dixie Doll brings a great combination of Ebony Masterpiece, Midnight Sun and Merry Boy lines, with a dash of Triple Threat and Midnight Mack K too. Only A Danger To Me carries no lines to the very popular Pride's Generator, so she is an excellent outcross mare for stallions who do carry crosses to that particular stallion. Available for breeding to all Tennessee Walker Horse stallions. Other breeds considered upon request. Please check open foaling years below. At first sight, Allen's Delight will impress with her flashy colour, but the quality of this mare lies not only in her looks, but also in her pedigree. Sired by Alen's Sky Time, a son of the six time World Champion stallion Spotted Alen Again, who sired numerous World Champions. Alen's Sky Time's dam is the grulla mare Champagne Sky, a granddaughter of Prides Favorite. Allen's Delight carries lines to Pride Of Midnight HF and Suns Eldorado. Allen's Delight is out of Threat's Souvenir, a granddaughter of the World Grand Champion Delight Bumin' Around. Her second dam Threat's Secret Cheer was also sired by a WGC, namely Pride's Secret Threat. Threat's Souvenir's lines also include Sun's Delight D, Go Boy's Souvenir, and Triple Threat. Allen's Delight is a beautiful blend of Midnight Sun and Merry Boy bloodlines that include many of the more recent champions and influential sires. And in addition to that, Allen's Delight can produce a wide variety of colours. John's Dixie Doll is a beautiful grey with some rare and uncommon bloodlines. She is by Another Grey John, who also sired the WGC The Touch. His grandsire, the 2 times WGC Pride Of Midnight HF, is one of the most prominent and influential sires in the breed. Many of the World Champions and WGC of the last few decades descended from this line. Through Shade's Paige Girl comes the uncommon line of WGC Shades of Carbon GL, a fantastic show horse with only a very limited number of offspring. Dixie Doll's dam is a very well bred daughter of Slush Creek's Jubal S. She carries the rare Hill's Perfection bloodline, which is hard to come by nowadays. Hill's Perfection went down in Walking Horse history as one of the breed's most formidable show stallions, winning 14 World Championships. He only had four offspring, of which only one (Sun's Merry Man) bred on. Dixie Doll carries two crosses to this stallion. Through Slush Creek's Jubal S, Dixie Doll also carries a line to WGC Ebony Masterpiece. Dixie Doll's second dam, Denim Doll, is a daughter of Merry's High Time, who brings a double cross to WGC Merry Go Boy into the pedigree. Denim Doll's dam, Bum's Little Dumplin', is a direct daughter of WGC Delight Bumin' Around, and out of a Merry Go Boy-bred mare. We had the "Pride Of Midnight HF over Hill's Perfection-cross" in mind for a while now, and we are very happy to have John's Dixie Doll to bring it into our breeding program. [Pride's Gold Coin ® x Quarterback's Bebe ®, by Sun's Quarterback ®]. Beautiful blue roan mare with Sun's Delight D, Sun's Quarterback, Brantley's Roan Allen II and Merry Maker in her pedigree. Nice blend of mostly Midnight Sun and Roan Allen lines. Only one line to Merry Boy. [Masquerading ® x SMS Coin's Blue Star, by Pride's Gold Coin ®]. Beautifully bred mare sired by WGC Masquerading. 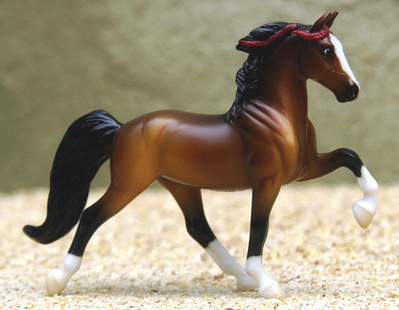 Combines Ebony Masterpiece, Pride's Gold Coin, The Pusher CG, Triple Threat and Merry Boy in her pedigree.